Our Community App gives you the opportunity to make predictions about the fluctuations in the price of Bitcoin and to become familiar with the world of cryptocurrencies and blockchain. 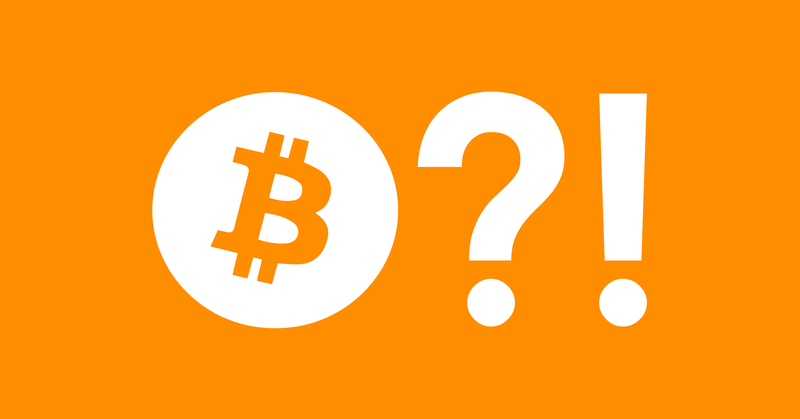 What is Bitcoin, exactly? How revolutionary is it and where does it derive its value? More than a simple investment, Bitcoin is a store of value for the digital age. It is important to educate and inform yourself about the asset in question, beyond the search for a return on investment. At first glance, this definition may seem a little obscure in the eye of the uninitiated. To understand the nature of Bitcoin better, let us take a look at today's most common method to exchange value: electronic money transfer via banks. How does it work? Let us look at a concrete example of how you transfer money to the person who is renting to you an apartment. If you trust the person and are close to him/her, you can exchange money with them directly. This solution is difficult to implement if you are not nearby and you often have to repeat this operation or if you do not have a particular relationship of trust with them. That is why, today, transactions can be carried out through intermediaries who ensure that money is exchanged properly: banks. Identification: you and the person involved in the transaction are identified as are your respective accounts with your banks by unique numbers. 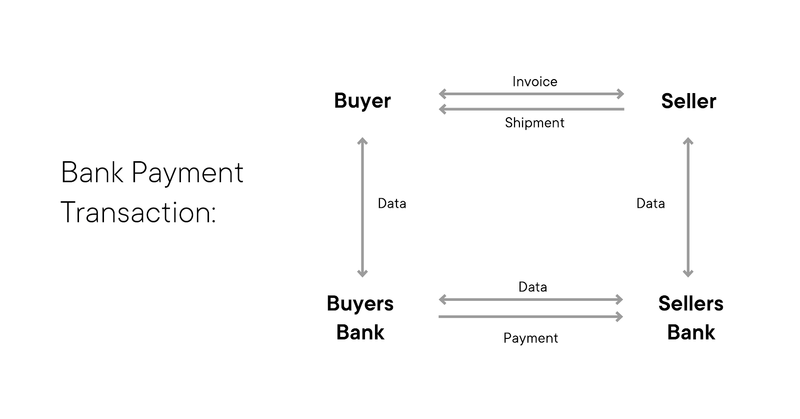 Validate the transaction: settlement is made between the two banks with a delay by an internal validation system, centralised with variable fees. The transaction history is centralised in the settlement ledger of the banks involved. However, an intermediary poses two problems: you must also have trust in the third party, the transaction can take time, the transaction history is centralised and this service will have variable fees that can be significant. Is this centralisation mandatory to have secure, reliable, fast and cost-effective transactions? Identification: each member can be distinguished by an identifier (a public key and a private key) that allows you to send or receive Bitcoin (such as the IBAN in the International Banking System). Securely validate the transaction: to validate a transaction, simply match the two addresses with a single secured complex character string. This is where cryptography comes in, which is nothing more than an extremely difficult mathematical problem that can only be solved by a large number of computers. And here comes the miners: anyone can participate in the network to help validate transactions by providing computing power. 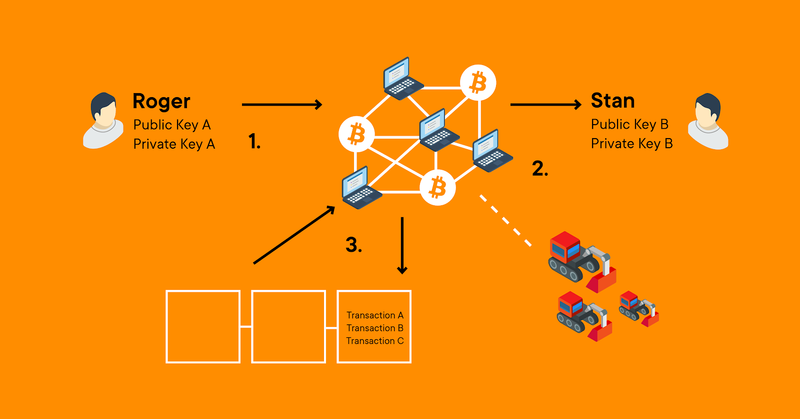 Transaction history: once the transaction is validated by the network, the exchange of Bitcoin is executed and the transaction history is secured in a ledger that is created by block: the famous blockchain. The entire ledger is distributed to all members of the network. Thus, trust in the transaction is not only an entity like a bank but thousands of computers that verify the proper operation of the network with non-falsifiable keys. In this chapter, we have explained the basics of Bitcoin. However, you don't have to understand it to trust it. You trust your life with cars and planes every day. The progress and the evolution of humanity are based on genius minds sharing what they discover with others. We don't understand most of what we are using in our daily life. The good news is that Bitcoin is open source! So anyone could check it. Despite the explanation of how this works, why does Bitcoin have value? And why does this value fluctuate? Bitcoin, the currency that can be exchanged on the Bitcoin network, can be bought or sold on trading platforms and its value is simply determined by supply and demand. If someone offers Bitcoin at $1000 and there is no other price offered above that, the purchase price will be set at $1000 as long as there is a buyer. Bitcoin having a fixed number of tokens (21 million), a significant demand naturally increases its price. This is what distinguishes it from a classic currency that is controllable by central banks. The price can be viewed live on our Community App with additional information that is important for understanding its evolution. Beyond the simple supply and demand, it is possible to define by a non-exhaustive list what is contained in the price of Bitcoin. 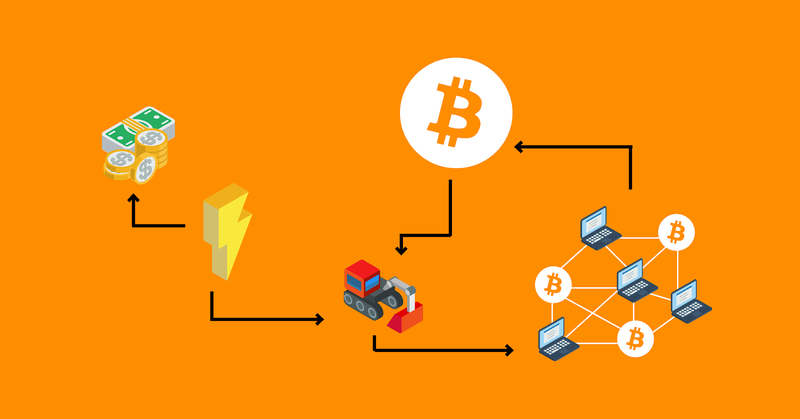 As mentioned above, miners participate in the Network's operation by validating transactions. When they validate transactions, they receive bitcoins as a reward. However, this process has an energy cost, exactly as does the gold extracted from a mine. This cost in electrical energy varies according to the different countries and the difficulty of the problems that the network must solve. Bitcoin is a gigantic and growing peer-to-peer network. It is possible to link the value of the network to the number of users of the network. Like the Internet, the more active users there are, the more valuable the network becomes. This law, Metcalfe's Law, is illustrated below and discussed in our 2018 Crypto Market Review. 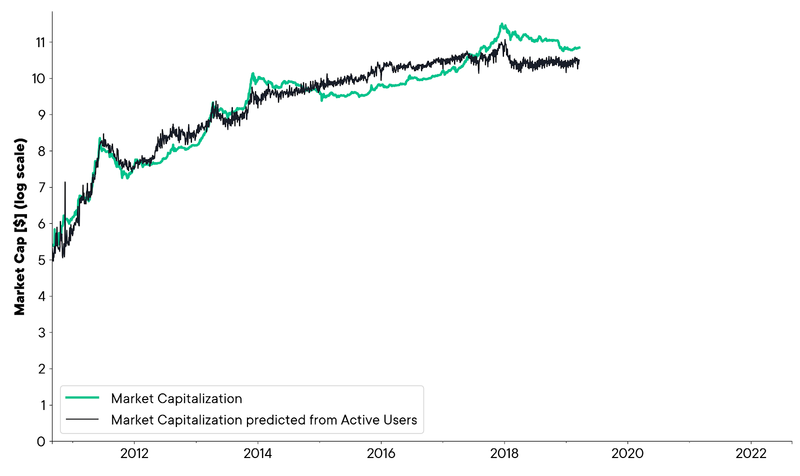 Empirically, in terms of network value only, it is possible to recognize when the network is over or undervalued. From a technological point of view, the network is evolving thanks to its design and the many developers who are gradually improving it. These developments have the potential to have a positive effect on the future value of Bitcoin. Moreover, since the adoption of Bitcoin is still in its infancy, there is a reason to speculate on the future value of Bitcoin. Beyond the technological aspects and its use as a value exchange, Bitcoin, with its finite number of tokens, secure and decentralised, can be considered as a safe haven of the future. Without going into detail here, just as gold has been and still is, depending on economic circumstances and the evolution of the ecosystem, it is possible that Bitcoin will be considered more and more as such in the future. In other words, money derives its value from the community that believes in it. What are the future developments of Bitcoin? As discussed above, when miners participate in the network, they are rewarded. Every 4 years approximately, this reward is divided by two: it is the halving. In 2020, miners will share more than 6.25 BTC per block. In other words, inflation will be limited and new Bitcoin will become increasingly rare. There is speculation about the effect of this halving on the price. Based on historical data, halving may be a catalyst but this will depend on the market situation in the months preceding this event.